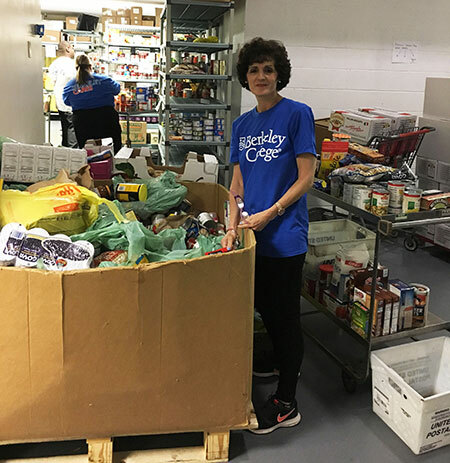 More than 400 Berkeley College faculty, staff, alumni and Honors students provided support to 43 nonprofit sites in New Jersey and New York as part of Community Service Week. The annual volunteerism event occurred throughout the week of May 21 to May 26, 2017. 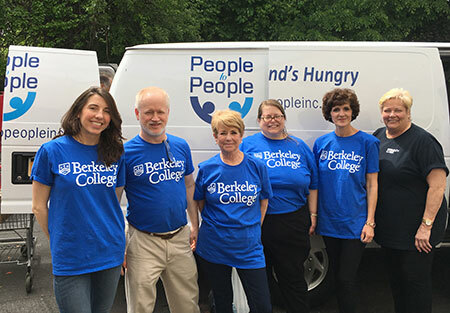 In Rockland County, NY, Berkeley College volunteers worked at the People to People food pantry in Nanuet, where they sorted and repackaged donated food items for families in need. “Community Service Week at Berkeley College helps build awareness about the role nonprofit organizations play in keeping our local communities strong and vibrant,” said Michael J. Smith, President of Berkeley College. Community Service Week is an initiative of Berkeley Cares, which throughout the year assists charities in the critical areas of food, shelter, health and student success. The event began as Community Service Day in 2010, and expanded from a single day of service to a full week in 2017 to allow more flexibility to the organizations the College serves. Photo Captions A and B: Berkeley College volunteers sort and repack donated food items for families in need at People to People in Nanuet, NY, as part of Community Service Week, held throughout the week of May 21 to May 26, 2017.